26th June 2018: BEC’s ambition to deliver its scheme at North Shore, Whitehaven, with the lowest possible carbon footprint has taken a significant step forward with the appointment of key advisors this month. Following a competitive open tender, specialist sustainable development and energy advisors SUSTaim Ltd and Sonas Energy have been appointed to develop a masterplan for low carbon activity at North Shore. 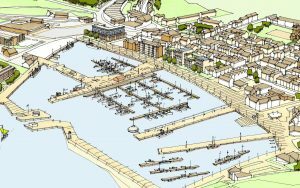 The plan will see comprehensive scoping activity to assess what is possible at the site – with a clear ambition to embed an approach that will see Whitehaven’s harbour front become a beacon for sustainable development that strives to be zero-net-carbon (ZNC). A ZNC building is defined as a highly energy efficient building that produces energy on-site, or procures, enough carbon-free renewable energy to meet building operations energy consumption annually. The whole scheme, being developed with partners including Whitehaven Harbour Commissioners and Copeland Borough Council, proposes a 4* hotel, multi-story car park facility and circa 75,000 sq ft office development. Current projects will see the delivery of a mixed-use office, start-up and innovator facility with supporting artisan eatery. Further road upgrades are also ongoing in partnership with Cumbria County Council. BEC had tender applications from all across the country and the Scottish microbusiness collaboration SUSTaim Ltd and Sonas Energy beat 8 companies to win the master planning contract. “We were particularly pleased to see their commitment to sense of place together with social, economic and environmental sustainability,” commented Joe.